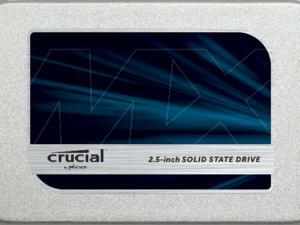 This drive offers the solid overall performance of MLC NAND at an affordable price. Toshiba/OCZ has struck again with its latest 2.5-inch SATA 6Gbps MLC SSD, the VX500. 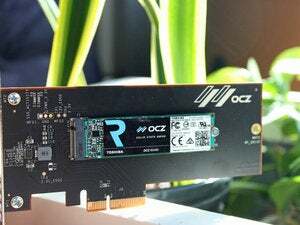 Released hot on heels of the RD400 (a fast M.2 NVMe drive), the mainstream VX500 delivers solid overall and sustained performance, and is featherlight—a boon for anyone looking to upgrade a laptop. The VX500 is available in four capacities: 128GB, 256GB, 512GB, and 1TB, with prices ranging from approximately $70 up to $350 (for the 1TB version on Newegg ). You pay a slight premium for the 1TB drive, but it’s still just 35 cents per gigabyte. And we’re talking about MLC (Multi Level Cell/2-bit) NAND, not slower TLC (Triple Level Cell/3-bit), which requires cache to attain 6Gbps-like write performance. Drives using TLC write substantially slower when the cache is full. Writing three bits simply takes longer than two. 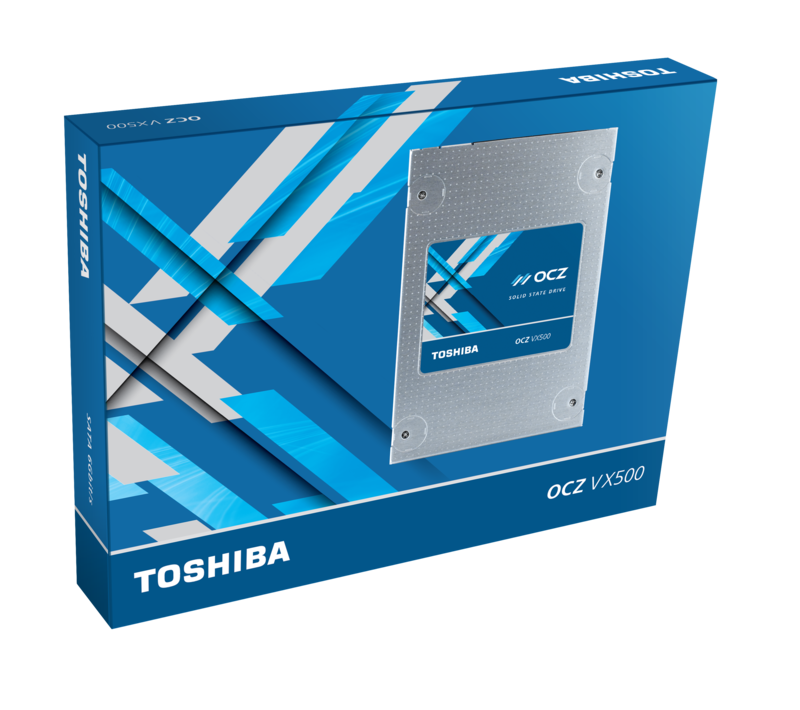 Retail packaging for the OCZ/Toshiba VX500, which includes a license for Acronis True Image 2016. 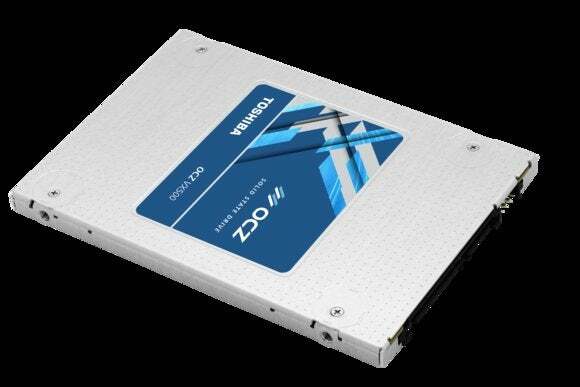 At a hair under two ounces, the VX500 is one of the lightest 2.5-inch SSDs we’ve ever encountered. Indeed, I was concerned OCZ might’ve sent me a mockup when I first held the unit. Its lack of heft and 7mm profile make the VX500 particularly suitable as an upgrade for laptops. And cloning the hard drive it replaces will be a snap since OCZ bundles a license for Acronis True Image 2016. By and large, the VX500 performed as expected for a modern MLC drive. 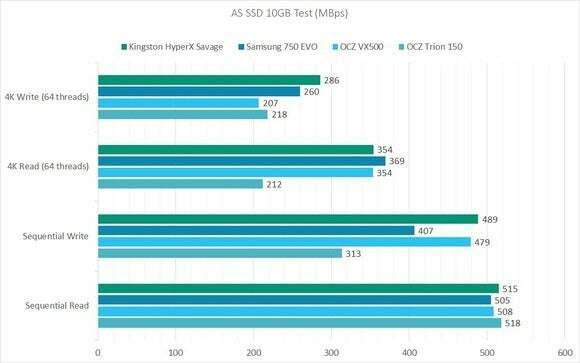 AS SSD rated its sequential reads and writes at 508MBps and 479MBps, respectively—a very good pace. Access times were scant, as with any SSD. 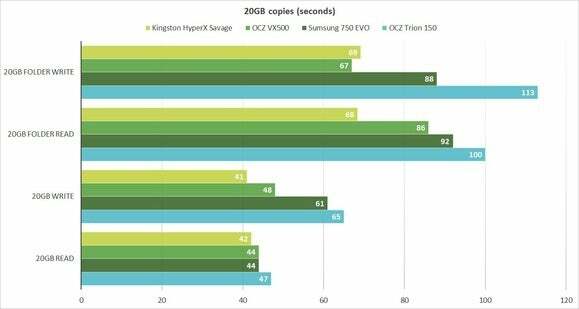 Unlike its TLC cousin, the Trion 150, the VX500 sustains its performance during long writes and is a worthy competitor to top-notch MLC drives like the Kingston HyperX Savage. The VX500 performed nicely in our real-world 20GB large-file read and write tests, as well as the 20GB small-file and -folder write test. However, for some reason, small-file/folder read performance was closer to what we see from TLC drives than a top MLC drive like Kingston’s HyperX Savage. We were a bit disappointed by the VX500’s small-file read performance, but otherwise it maintained pace. The VX500 is warrantied for five years, and endurance is rated for 74TBW (terrabytes written) per 128GB of capacity. The drives are also covered by Toshiba/OCZ’s advanced warranty program. It should probably be called “advance,” because if the company determines that the drive is defective after you consult with a tech, it will advance you a return shipping label for free. Though we weren’t overly impressed with the VX500’s small-file read performance, its overall and sustained performance still easily exceeds that of TLC drives. When comparing it against other MLC drives, consider the overall performance and cost. If you’re upgrading a laptop, factor in the VX500’s light weight too, which should put it over the top.